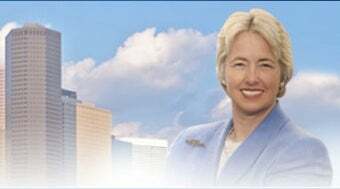 Houston City Controller Annise Parker became the first openly gay mayor of Houston yesterday, winning a runoff election with 53% of the vote. Houston, in turn, became the largest city to elect an openly gay mayor. The runoff vote took place after Parker and her opponent, fellow Democrat Gene Locke, failed to secure over 50% of the vote on Election Day, and according to CNN, only 16.4% of eligible voters came out to the polls. Low turn out aside, Parker's election is still a milestone, as she noted in her victory speech: "Tonight the voters of Houston have opened the door to history. I acknowledge that. I embrace that. I know what this win means to many of us who never thought we could achieve high office."